In 1990 when we built our new house, we had a half glass door leading from the family room to the back yard. 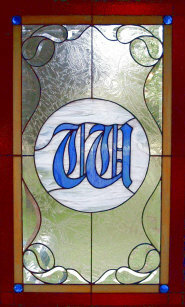 I designed and built the Old English "W" window on the left to give us some privacy, and add a little color to the room. It originally was 22"x 36" and contained 77 pieces of glass. For 27 years we have enjoyed this window every day! Several years ago our son, Chris, moved back home after college to save money for a house. He achieved that goal and saved enough to make a sizeable down payment. He contracted to build a new home and thanks to his industrious saving, and favorable interest rates, he was able to buy a first home way beyond his original expectations. His new home was finished in April, 2017. 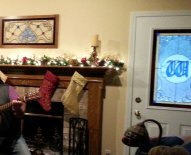 To the left is Chris's Window hanging in the dining room of his new house. Note the dining room table below the stained glass. 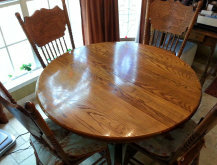 It is a 1970's solid oak dining room table that Chris grew up with. 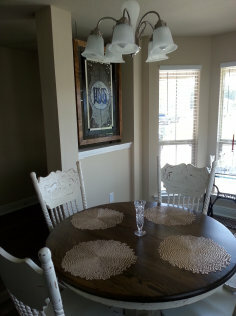 We had it refinished or repurposed for his generation in much the same way that I repurposed his stained glass window. We are excited about our son's new home and happy that he wanted to take some of his family history with him. 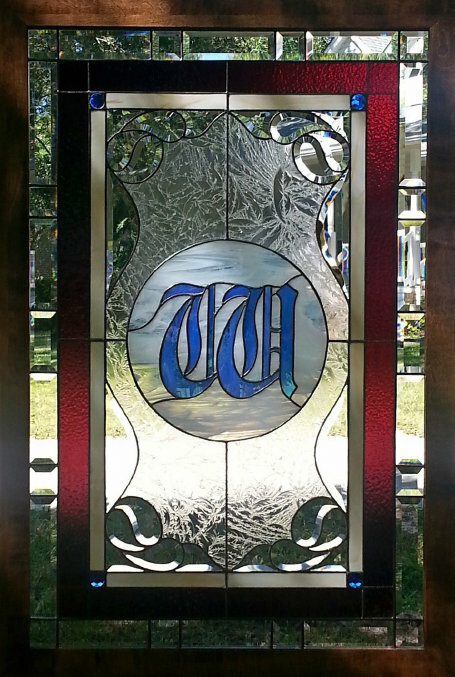 Just inside the entrance of his house is an opening perfect to hang a large piece of stained glass. The "Old English W" from our house seemed like the perfect piece but it wasn't framed ready to hang. I decided to add a row of 2" bevels to really make it sparkle and build a wood frame to hang it in the opening. The 2" bevels and a 2" wood frame brought the total size to 30" x 44" and increased the glass pieces to 105, a pretty substantial window. To add some additional history to this 26 year old window...... I had a wood bed rail from a 1950's Ethan Allen bed that I was able to rip, sand and fashion into a beautiful 2" maple frame.